Columbia River M16-04A M16-04A Tanto Plain Edge Folding Automatic Knife FREE SHIPPING! Add a 100% American-made blade to your collection with the M16-04A Tanto Plain Edge Folding Automatic Knife from Columbia River. 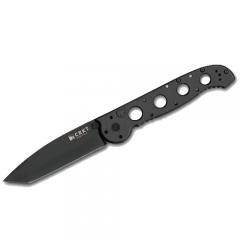 An updated version of Columbia River's M16 knife, the M16-04A includes an automatic feature equipped with a patented safety on the handle spine to hold the knife securely open or closed. The plain-edge blade is honed from premium CPM 154 that holds its edge even after continuous use and finished with a handsome black matte DLC coating.The skeletonized handle is crafted from 6061 Type III anodized aluminum and designed for lightweight mobility and a secure grip. The knife includes a pocket clip which offers three different carrying positions for versatile carry options. ©2002-2019 CopsPlus.com: Columbia River M16-04A M16-04A Tanto Plain Edge Folding Automatic Knife FREE SHIPPING!